11:30am on Thu. and Sat. We meet at the exit of Fontana metro station, a few steps away from the Llibertad Market. The group is small, and the guide inquires there and then as to what each guest wants to eat and explore. The guide also provides anecdotes to illustrate the peculiar history of Catalan food – do you know why the paella in Barcelona is made with noodles and not rice ? And how about the difference between Serrano and Iberico ham ? Our first stop is generally at the fish stall, to compare the catch of the day from the Atlantic vs. the Mediterranean. We talk with the fishmonger, and we try to talk him into preparing “chipirones de la playa” cuttlefish on the go for us to grab on our way back. and beverages, a local craft beer or a glass of Rioja wine. We make the most of Llibertad Market –a unique locale only locals shop at. We experience authentic Barcelona like no tourist ever does – sipping a fresh-squeezed juice and enjoying some people-watching, and observing local farmers interact with local clients. We stop at local eateries and drink stands, to sample the foods we’ve just picked, to discuss them, and to decide what to eat next. Like any food lover, each tour will make room for the particular season and the delivery of the day. Our Barcelona Food Tour start on time at 11.30m rain or shine and last a leisurely 120 minutes. We meet outside metro Fontana (line 3) at street level (153 Carrer Gran de Gràcia). The walking tour ends outside Llibertad market. For great samplings of Catalan foods: cured ham, mountain cheese, fresh fruit juice, organic vegetable a la plancha etc. Barcelona Food tour is 55€/adult, 39€ for kids age 17 and under. 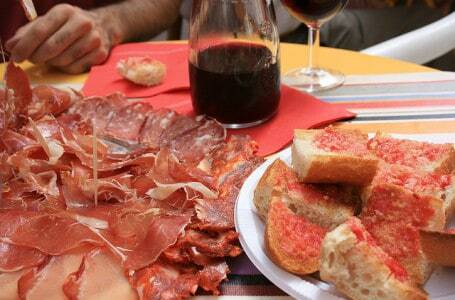 The Barcelona food tour runs on Thursdays and Saturdays for 2 hours. The tour starts on time at 11.30am.